Surrounding area of Holiday Villa “Aventurero”. Nearby is an old farmer’s village, Los Romanes (1.5km. ), which has retained all of its charm and loveliness. You will find an antique olive oil factory with old implements there, as well as two chapels: one for the holy Milagrosa and one for the Mother of Sorrow. Los Romanes and the village La Viñuela (5 km.) have several supermarkets and restaurants. At a short distance from the Holiday Villa “Aventurero” you will find a Hindu restaurant (1 km). You can easily reach this walking. The village of Alcaucin (14 km.) is worth visiting as well. It is as if time stood still in this village. The authentic old houses seem to stick to the steep mountainside and the narrow streets lead to a sunny village centre where the residents still collect water from a clear-water spring. The village square has cozy little restaurants and terraces. The town Velez-Malaga (15 km.) is a typical Andalusian town with narrow streets, passageways, impressive squares and a beautiful promenade with ancient plane trees and large fountains. There are many little shops and outside the town there are large supermarkets which offer almost everything you could ask for. The supermarkets are easy to reach by car. Along the coast you will find Torre del Mar (17 km. ), with its numerous terraces and restaurants. The boulevard contains a wonderful park over a length of 4.5 km. Torre del Mar also has a busy nightlife. Along the beaches of Torre del Mar you can find various excellent fish restaurants, where you can enjoy freshly caught fish. The dishes will be prepared for you on the spot, using authentic methods. 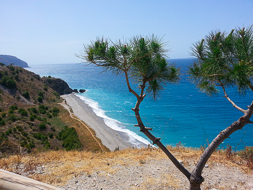 We also advise you to take a coastal tour to the medieval fishing village Nerja (41 km. ), one of the most beautiful coastal villages in the world. In the village centre only pedestrians are allowed, but you can easily park your car in the parking area nearby the boulevard. Nerja’s boulevard leads into the sea as if it were a balcony, which is why it is often called “The Balcony of Europe”. From this balcony you can enjoy marvellous views over the ocean. You will also find the famous caves of Nerja interesting, because these caves are used as a theatre. Many well-known musicals and festivals have taken place there. Please clic here for more information. Visiting Granada 120 km. will prove to be a highlight of your stay. Granada is world-famous for the Alhambra palace and the beautiful water gardens. For more information please clic here. 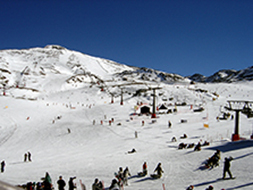 The 3485 meters high Sierra Nevada mountains have an Olympic ski resort, which is open from November to May. It can be reached by car in approximately two hours. Make sure to book your ski’s and snowboards in time! During the summer you can make the most adventurous mountain hikes, passing by the white Moresque villages. Please clic here for more information. Lastly, Malaga (51 km.) is a large city with an international air- and sea port. It is an amazing city for shopping and has many high-grade fashion shops and beautiful boutiques.